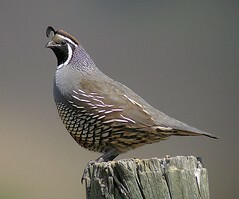 Photo by Len BluminCalifornia Quail - THIS is the bird that got me hooked on birding. Spotted one in a tree on 17-mile drive near Monterey, California after puzzling over the queer call I was hearing. Gorgeous bird. Quite distinctive and easy to identify. 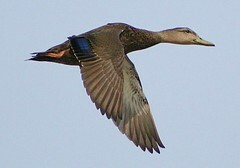 Not much of a flier--very rapid wing beat. 6/30/2008. Spotted another in Sunol Regional Wilderness (Maguire area) perched on a post, just like this picture. 7/6/2008. 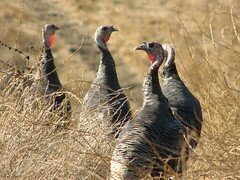 Photo by 'Kevin'Wild Turkey - Spotted in Mission Peak and Sunol Regional Wilderness with very cute babies in tow. I didn't remember they could fly...though their flight is more like a superman leap. Don't seem to fly much distance. Photo by Brent MooreMuscovy Duck - Totally odd duck. Looks diseased, but they are not. These are domesticated ducks, so not in guidebooks. They hang out in parks. Do not migrate. Produce good, lean meat. 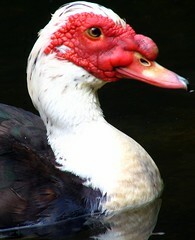 Here's the Wikipedia entry on the Muscovy Duck. Lake Elizabeth July 2008. Photo by Isidro Vila VerdeMallard - All over Lake Elizabeth and seemingly every waterhole on the continent. 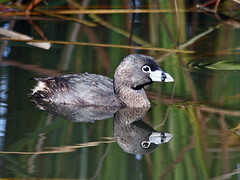 Photo Copyright � 2005, 2006 Michael L. BairdPied-bill Grebe - Saw a mother and young'un on Lake Elizabeth. Mother was diving for food, and the young one calling for her return. This is an especially good shot by Michael L. Baird of a bird like I saw. 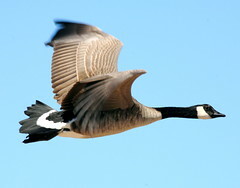 Photo by Steve JurvetsonCanadian Goose - All over Lake Elizabeth in Fremont, CA. 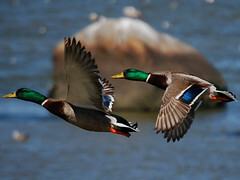 Beautiful in flight and in a V formation. Photo by Robert KeereweerAmerican Black Duck - I think I saw a trio of these--their olive bills indicated they were not just female mallards, but I could be wrong. 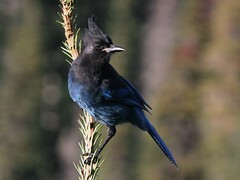 Photo by Jean-Guy DallaireStellar Jay - Watched a beautiful Stellar Jay in the forest about Sunol. Very active and curious, as expected. Marvelous bird to observe. This one kept hoping from branch to branch, tree to tree, trying to find stuff to steal from other birds. Very persistent little bugger. July 2008.